Very recently, Hurricane Irma barreled through the Atlantic, causing severe damage to several islands before finally landing in southern Florida. The Sunshine State was lacking sunshine, and a significant portion of the state was lacking power, too. As soon as everything starts getting back to “normal,” people get back on the roads. But what are the laws when the power is out and the stoplights don’t work? Here are a few scenarios you may run into on the road after a Hurricane and how to handle them. First thing’s first: if a road is flooding, or has any significant amount of running water, don’t try to drive through it. With running water, it can be difficult to tell how deep the water actually is until it’s too late. Take an alternative route or head home until the water has drained. If you come to an intersection and the stoplight is completely out of power, treat it as a four-way stop. If you need a refresher on the laws of navigating a four-way stop, we’ve got you covered. A flashing red light at an intersection means you should treat it as a stop sign. This does not guarantee that cross-traffic will stop. When you stop at the intersection, check and see what the cross-traffic light is showing. 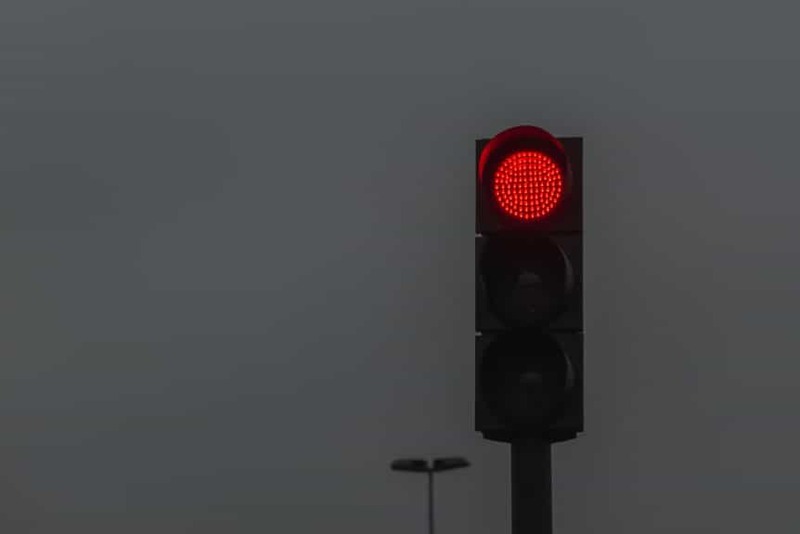 If it’s blinking red, the light is to be considered a four-way stop. If it’s blinking yellow, it is a two-way stop and you need to yield to cross-traffic. If a stoplight is flashing yellow, you should slow down and proceed with caution. You do not have to stop at this light. However, it usually means that cross-traffic has a blinking red light and may enter the intersection if they think the coast is clear. If the power is out, lights are unable to flash to alert you to a school zone. If it is during the hours listed on the sign, slow to the posted speed. If not, continue cautiously through the school zone while staying alert for kids in the area. Even when electricity is operating properly, you should always pull over for emergency vehicles. When the power is out and you hear emergency sirens, they may be responding to an incident right near you. Immediately pull over and let the emergency vehicle pass before you continue. Keep an eye out for fallen power lines or an accident as you proceed. Defensive driving is always important, but with power outages, everyone’s nerves and patience are on-edge. Exercise caution when approaching intersections or potentially flooded areas.